Brazil people are probably not what you think about when you think of Brazi but they should be. When you think about Brazil you probably think about things like Carnaval and beaches. There as so many things to love about Brazil, and the people should be on top of that list. Here are seven good reasons why you will love the people of Brazil. 1. They are very friendly. Everyone who has ever been to Brazil will tell you that the Brazil people are very warm and friendly. They are also very generous. They will invite you over for something to eat or drink, and it will be a genuine and sincere invitation. 2. They love to party. Or celebrate. Or have a good time. Brazil is home to the world's biggest party, and there is a good reason for that. 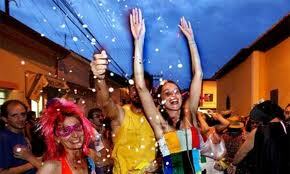 Brazilians love to go out and have a good time. They will get together with family, friends and good food tp celebrate just about anything. They wholeheartedly throw themselves into the party, and focus on the moment. 3. Brasileiros love a slower pace. All around the world the pace of life is speeding up. In Brazil, the goal is to keep it slow. It's not about getting to the end, and hurrying through everything. It's more about how you get there and watching along the way. Everything is just slower, more laid back. 4. Football. Brazilians love life, and they throw themselves in that life. This is especially true when it comes to football. Football stars in Brazil are put on the same pedestal that movie stars are put on in other countries. If you say the names Ronaldo, Pele, Zico or Marta anywhere in Brazil everyone will know who you mean, and will be able to give you their opinions on them. 5. Brazil is multicultural. Brazil is a true melting pot. Brazilians, and their culture, are a mix of the Portuguese settlers, Brazilian native peoples, African slaves and Caribbean peoples. This has lead to a unique culture that took all of that and made it into something completely new. This is seen in everything and everywhere. 6. People come first. Brasileiros place more importance on people and relationships than they do on things. If you need something or call somewhere you are going to be dealing with a real person and not a computer. Brazilians are going to be interested in you and who you are. This can be frustrating for people who want to get right to the point. 7. Music and movement. While this seems like it should fit in with parties and celebrations, it really does need its own section. The Brazil people love music and dancing. It's part of who they are, and it surrounds them. Music and dancing are even part of capoeira, a martial art developed in Brazil. Let Carnaval or the beaches be what brings you to Brazil in the first place. Once you get there you'll fall in love with the Brazil people, and they will be the reason why you come back.